All warehouses need an efficient process to receive and put away goods. World-class receiving is facilitated by the use of advanced shipment notices, which we call ASNs. An ASN notifies the distribution center of a pending delivery and usually is transmitted via electronic data interchange. This improves inventory accuracy and greatly reduces receiving costs. Cost reduction estimates are in the 40 percent to 50 percent range. To optimize warehouse efficiency, the DC (distribution center) needs to focus on and minimize three things: travel distance, touches and paper. A key to efficient picking is proper profiling or slotting. Many DCs dedicate full-time personnel to the task of profiling or slotting. Their job is to ensure that high velocity SKUs are placed in convenient, easy to reach areas to minimize pick times. Travel time is three times more impactful than search and selection time, although both are important and both are facilitated by a good profiling system. 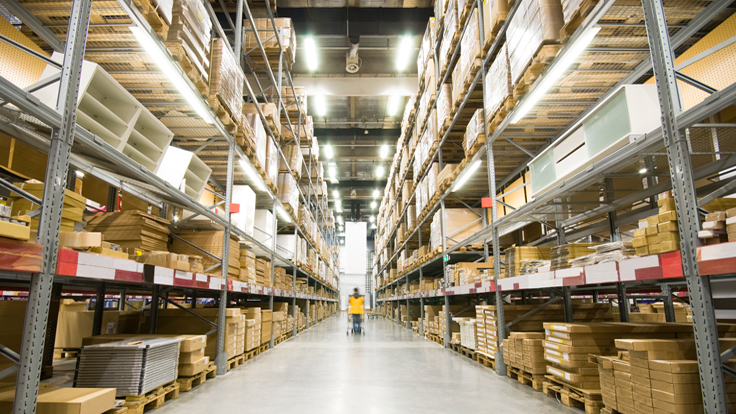 In fact, a primary goal of warehouse layout is to facilitate order picking. Below are some examples of lean concepts commonly used in DCs. Keep it simple: The lean journey should focus on straightforward activities that everyone can see and understand. Lean is a lot about total employee involvement in a continuous improvement effort. 5S: 5S refers to a methodology and mindset that ensures that all areas are neat, clean and have everything in place. The five S’s usually stand for sort, set in order, shine, standardize and sustain. Total employee involvement: It creates a learning organization that focuses on continuous improvement or kaizen. Standard work and making problems visible: All work needs to be documented rigorously, which ensures continuity of improvements and makes deviations more visible. Management walkabouts: Managers need to get up, get out and about and talk to people face to face. It’s the only way to understand the problems and the mood of the organization. Total productive maintenance: This not only promotes employee involvement and ownership, but also reduces unexpected downtime. Eliminate before you automate: An “eliminate before you automate” mindset avoids hardwiring waste into an operation. Value stream mapping: It helps identify value-added vs. non-value-added activities in a process. Six Sigma: Six Sigma simply means a measure of quality that strives for near perfection. It is a disciplined, data-driven approach and methodology for eliminating defects and variation in any process. Cross-docking is the process of receiving product and shipping the product out the same day without putting it into storage. The cross-docking practice frees warehouse space and speeds service to the customer. Make sure that your metrics have a logical framework. Key performance indicators for a DC or any other business entity need to be linked in a logical framework to the goals of the company. Selecting the right metrics and defining the associated responsibilities is important. Leading companies benchmark best-in-class performance and then set goals accordingly. The idea is to reduce operator and equipment movement as much as possible to minimize the cost and number of people required to run the warehouse. the needed functionality must be identified first. Some of the most common capabilities of warehouse management systems are goods receipts, put-away, profiling, picking, shipping, real-time visibility into inventory and orders, labor management, yard and dock management, inventory cycle counting, reverse logistics and small parcel management. Below are some ideas companies have used to optimize warehouse space. Eliminatingtoo many slow-moving SKUs that consume their space in a sporadic and partial manner. Racking and mezzanines. If products are not stackable, then racks and mezzanines can be used effectively to fill the cube of a warehouse. Stacking height and product stackability. Warehouse layout, docks and aisles. How many DCs should you have? Which customers, stores or locations should each serve? Safe DC operations require a combination of mindset/culture, metrics and processes. Everyone in the facility every day needs to think safety. Security to avoid theft and pilfering is more important for some products than others. Dishonest employees can defeat the most elaborate security system. High-theft items must be placed in their own secure areas. There should only be one way in and out of a DC, barring an emergency situation, and that entrance/exit should have detectors. Having the right people in the right jobs is key. Way to retain good employees and minimize turnover are pay a fair wage for the area, show appreciation, and foster an atmosphere of ownership by involving employees in DC improvements. The extended supply chain generates much of the carbon dioxide emissions for most organizations, so it makes sense for the supply chain team to lead the charge on corporate sustainability. Some best practices are cardboard recycling, plastics recycling and minimization of the use of shrink-wrap; moving from propane to electrical lift trucks; working with vendors to reduce packaging materials; returnable and especially collapsible containers; reuse of wood pallets; caulking and weather stripping around windows and doors; seals around dock doors and appropriate insulation; automatic adjustments to the HVAC system when the building is not in operation; natural lighting, such as skylights or solar panels; motion detectors for lighting in low-traffic areas and photo sensors for outdoor lighting; efficient lighting systems and reducing the use of lighting in areas where it is not needed.